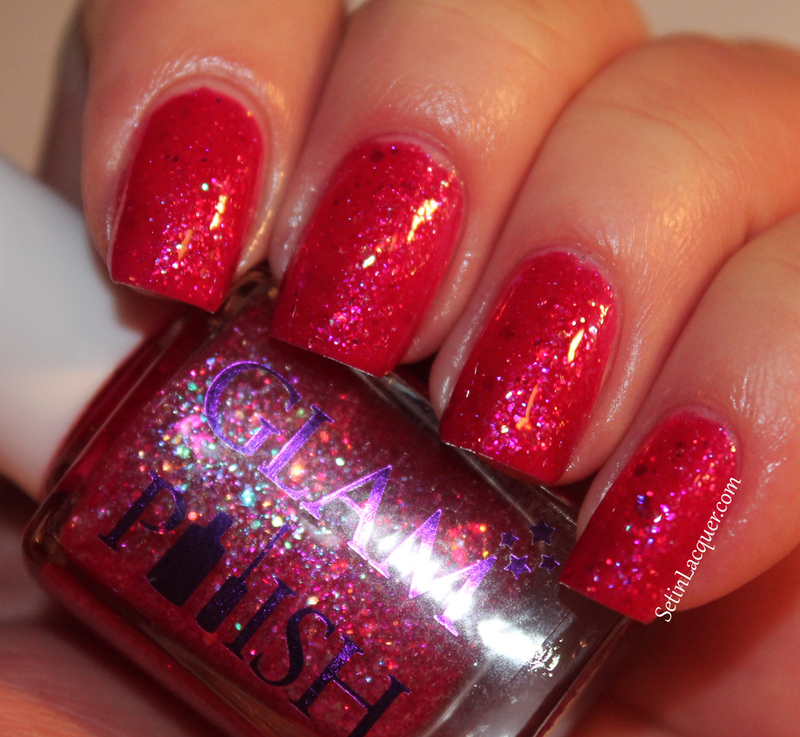 I have some stunning polishes to share with you today - Glam Polish Festival Collection. 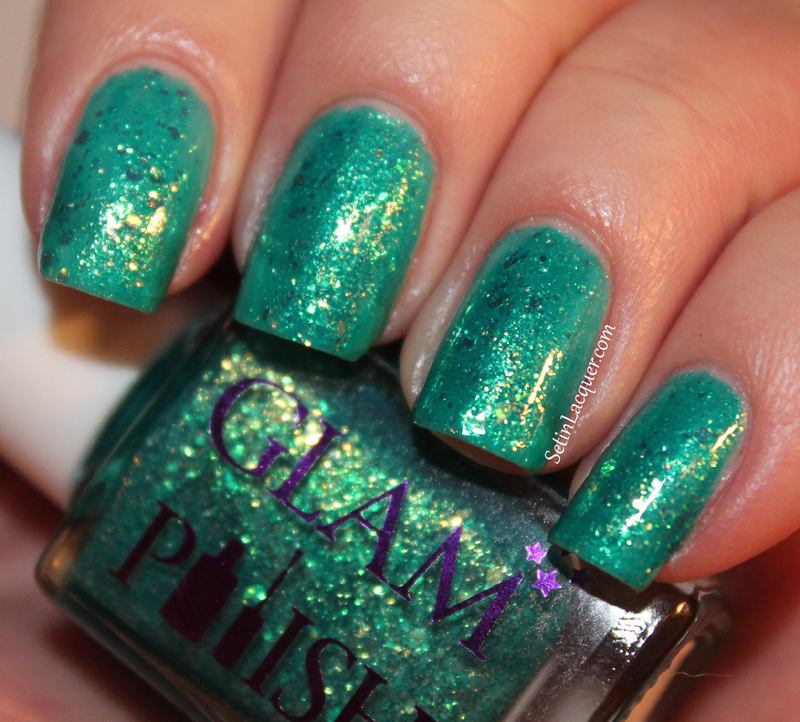 If you have tried Glam Polish - you know how wonderful they are; and if you haven't tried them - you should! This collection is inspired by the creator's favorite albums and song lyrics. 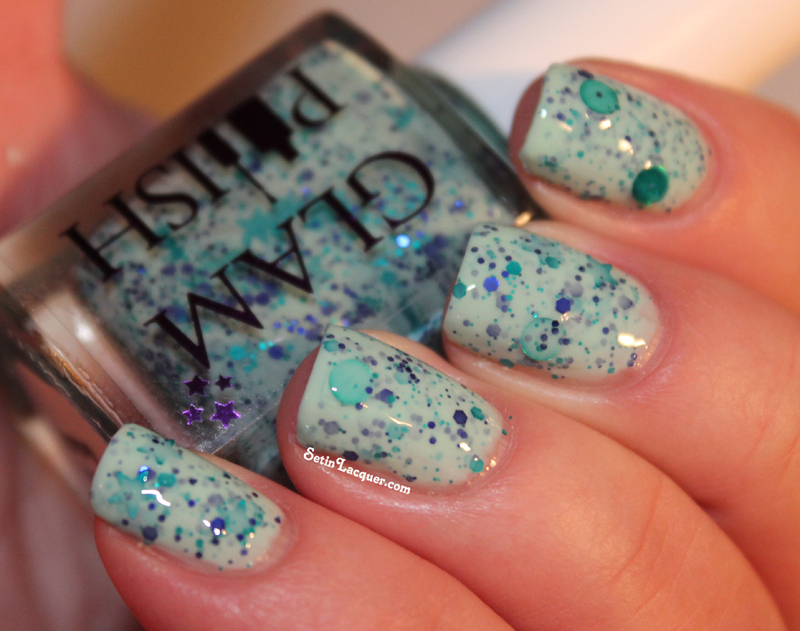 They are gorgeous jelly polishes featuring a mix of iridescent glitter and tiny flakies; and they are simply stunning! 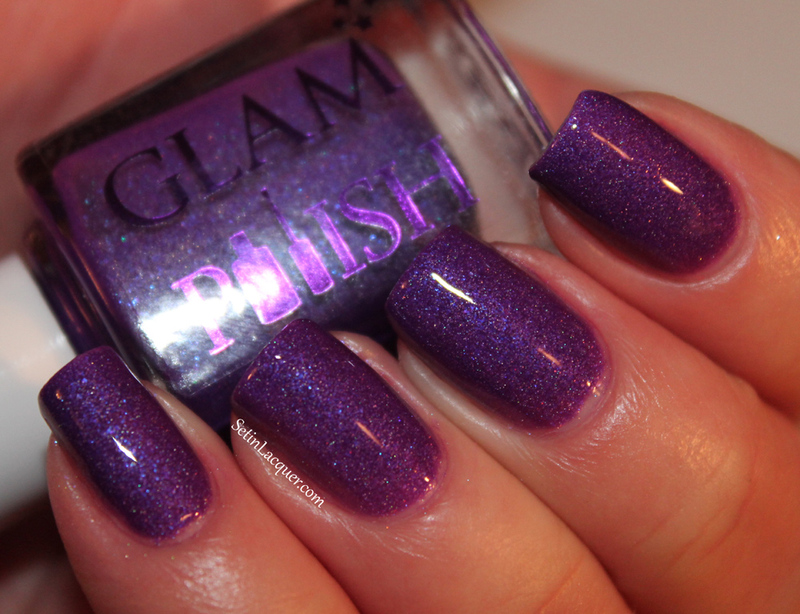 And I would be remiss if I didn't mention the Glam Polish Giveaway! Let's take a look. All of the swatches are shown with two coats and a top coat unless otherwise noted. The formula is divine. Jellys can sometimes be touchy, but these are a dream. 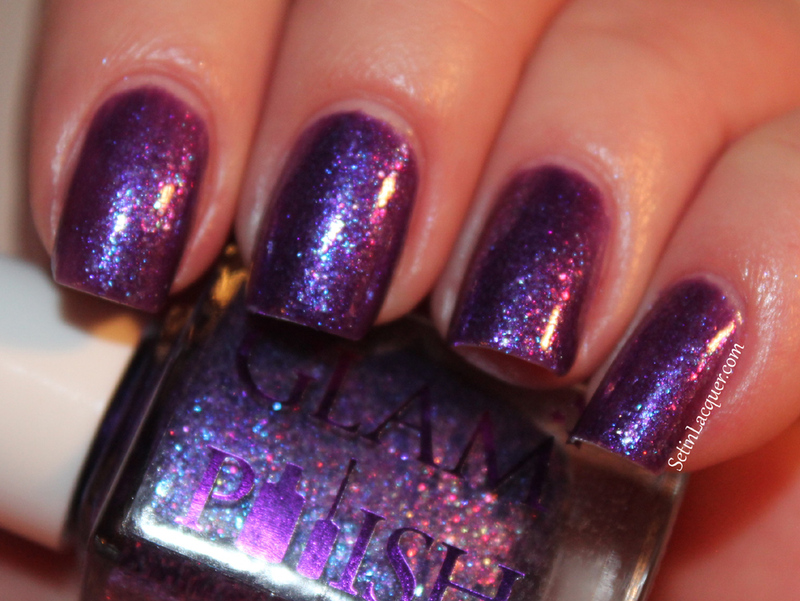 Diamonds on the Inside - is a stunning deep, mesmerizing purple with a glittery and shimmery finish. The depth of this polish is awe inspiring. Distant Sun - is a magical, glittery topcoat. It has iridescent flakes, glitter and holographic micro glitter. Normally I don't oooh and ahhh over glitter top coats. But this one has me doing just that. It is shown over Milani Black Swift. 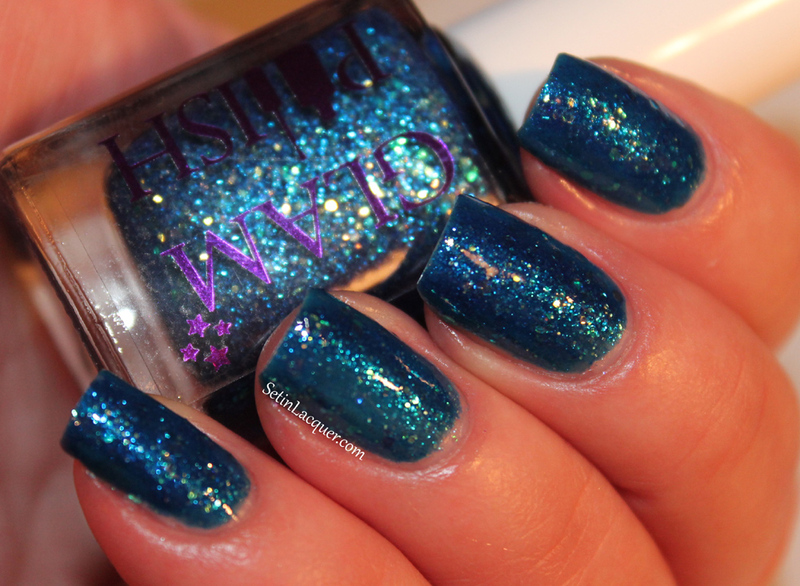 Nightminds -is a mind bending sapphire blue. 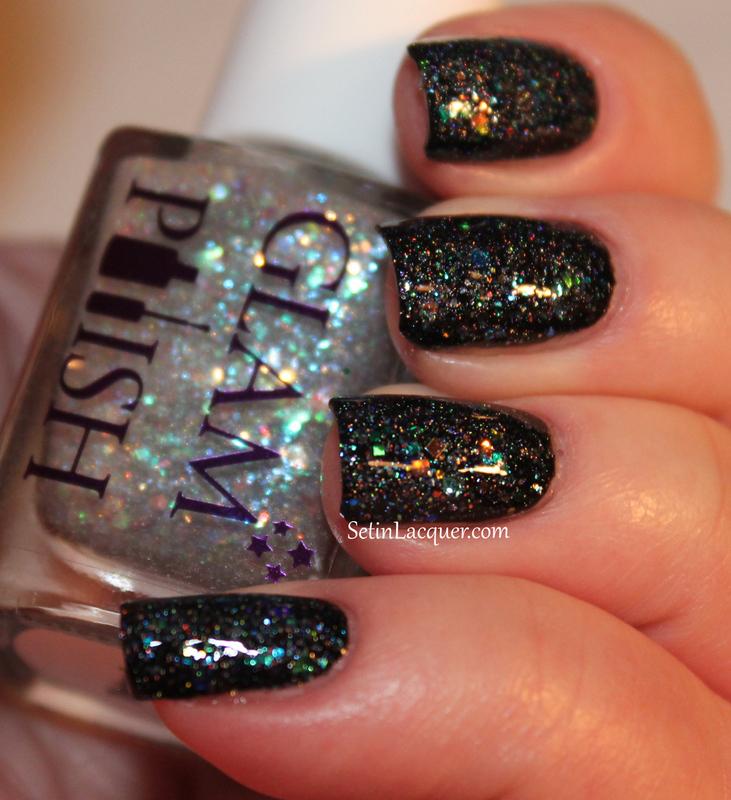 This polish has depths that will mesmerize you. Songbird -is another amazing polish. It's not a true red, and yet not a true pink. The color is truly unique. Sunrise Over Sea - is another unique shade. It's an aqua blue with a softness that makes it stand out. 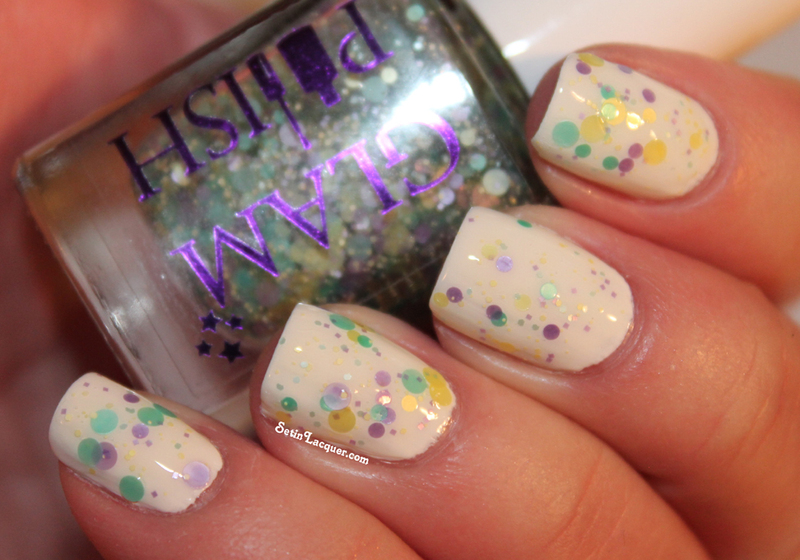 The iridescent flakes make it shimmer with golds and provides a opalescent sheen. The stunning shades are available for purchase individually. Diamonds on the Inside can be purchased for $10.95 and all others for $9.95 each. They can be ordered from the website with shipping to Australia and the U.S. available. International fans -these will be available in late February or early March from some of the International Stockists. 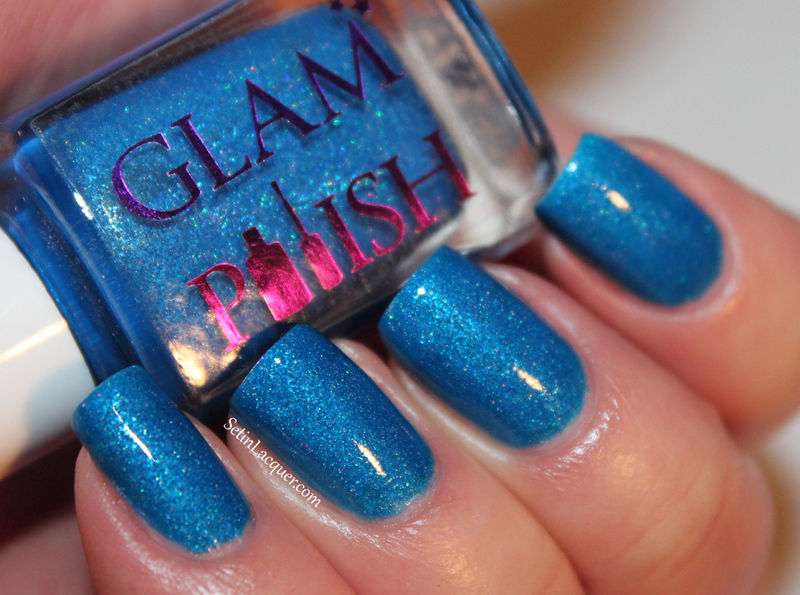 To stay up on this and more Glam Polishes, follow the Glam Polish Facebook page. It's Day Four of the Dozen Days of Giveaways and today's prize of the A England Ballerina Collection is sponsored by Color4Nails. Color4Nails carries some magnificent, international polishes on her online store. Friendly service and a great selection. This giveaway begins on January 31, 2014 and will end at midnight, February 9, 2014. The giveaway is open to international entries and you must be 18 years or older to enter (or have parental consent). Enter via the Rafflecopter Widget below. 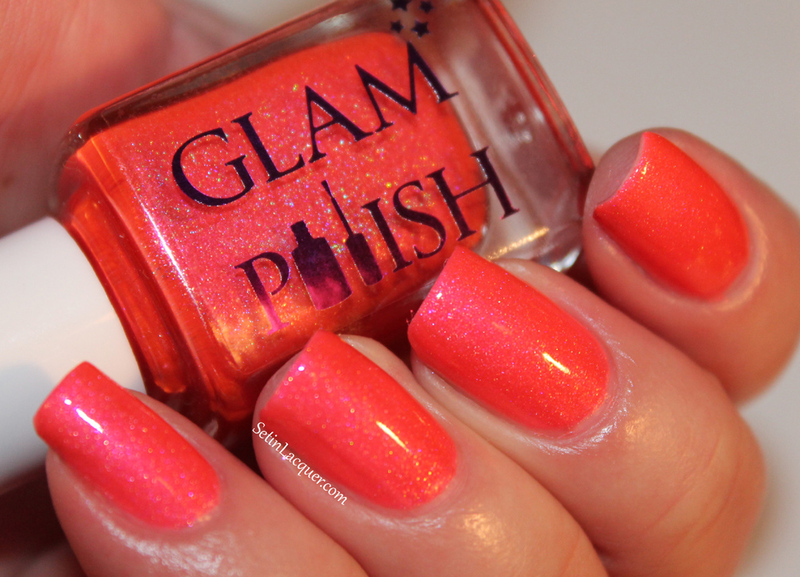 I have reviewed quite a few of the Glam Polishes and I can't choose a favorite. They are all gorgeous! Make sure to check out her online store or visit the international stockists to shop for these stunning polishes. This giveaway begins on January 30, 2014 and will end at midnight, February 8, 2014. The giveaway is open to international entries and you must be 18 years or older to enter (or have parental consent). Enter via the Rafflecopter Widget below. 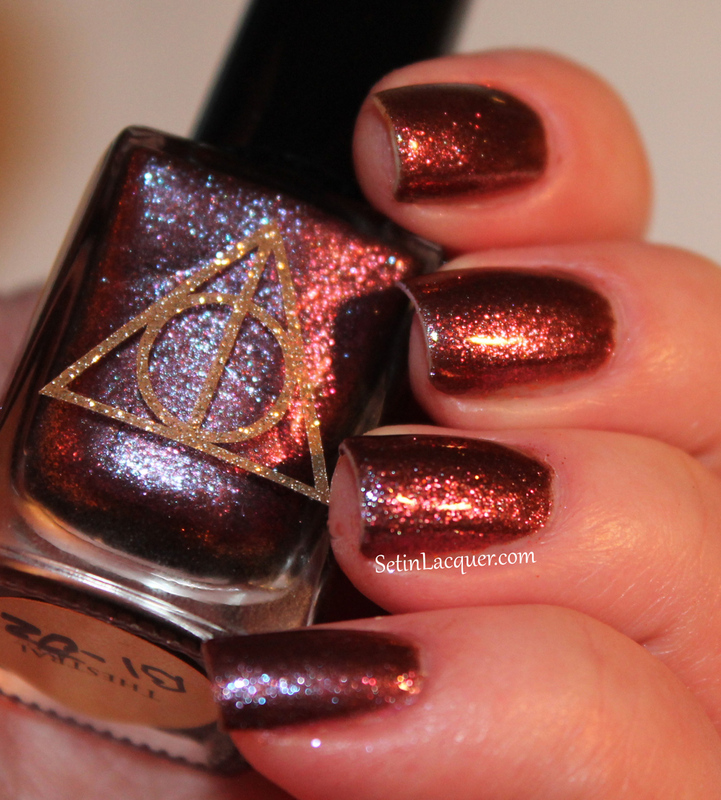 Fandom Cosmetics - Harry Potter 'Battle of the Seven Potters' partial collection - swatches. I have a new-to-me nail polish brand today called Fandom Cosmetics. Fandom was created in May of 2013 out of a love for all things fandom. They immerse themselves into ever fandom they represent. 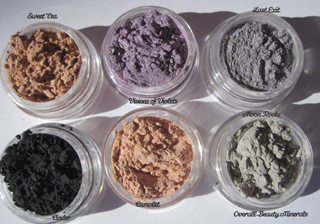 The founders of Fandom Cosmetics have met with every manufacturer of their glitters, pigments and base to ensure the ingredients are to their specifications. 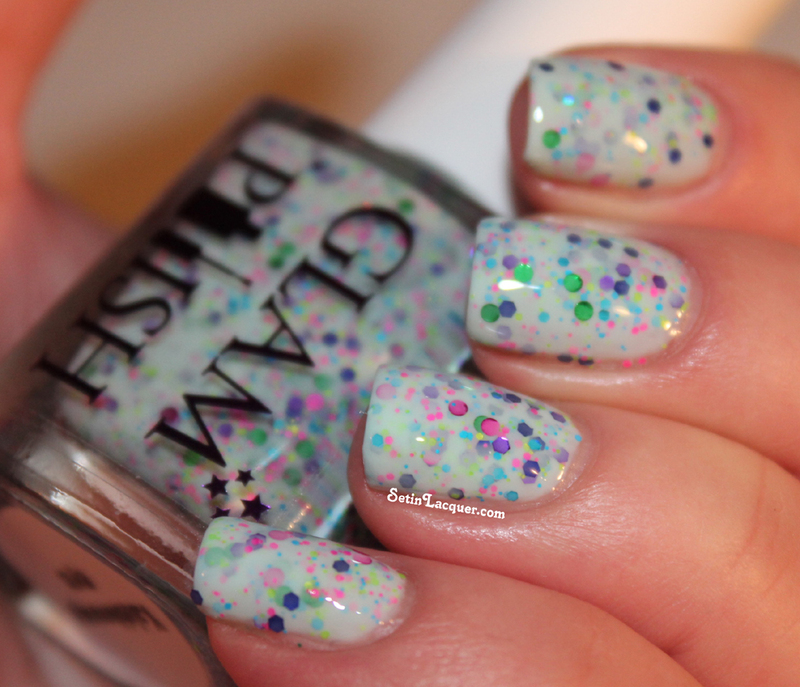 Glitters were tested for five months before they started selling their polish. Their base is 5-free, vegan and cruelty-free. 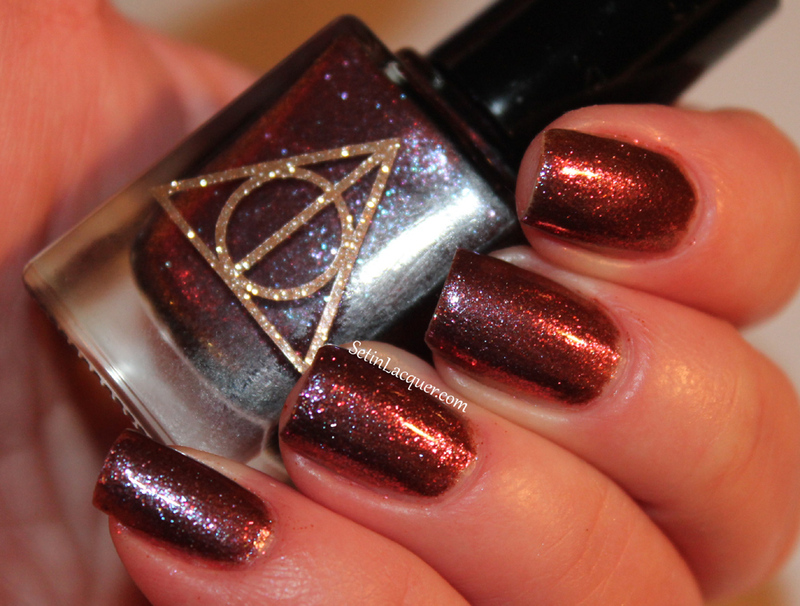 The polishes I have for you today are part of a new collection that will be released next month - a limited-edition Harry Potter "The Battle of the Seven Potters" collection. It is inspired by the spell, potion and magical creatures that played a role in that event. The formula on these polishes was good. It applied evenly and dried relatively quickly. Let's take a look. All of the swatches are shown with two coats and a top coat. 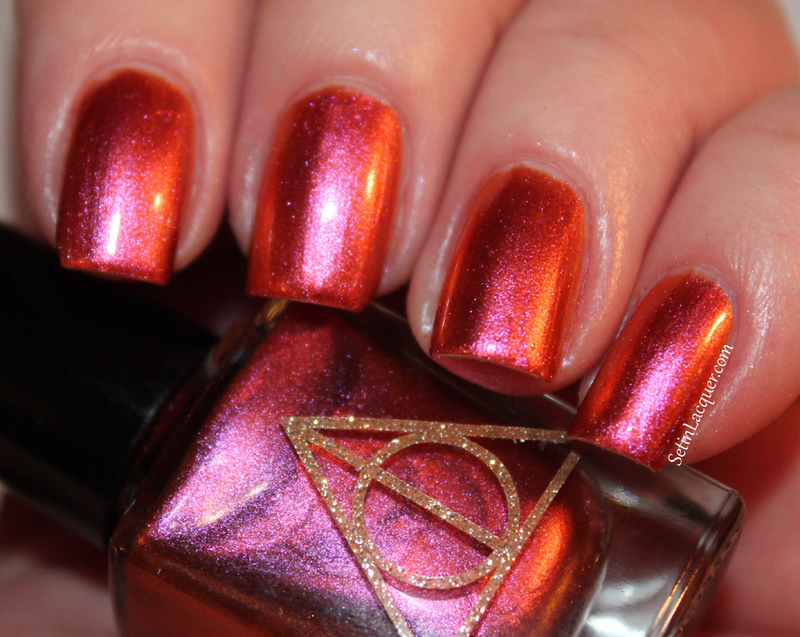 Expelliarmus - is a stunning soft burnt orange with a slight duochrome shift to a rose shade. It is really gorgeous! I think I will be wearing this polish a lot! Make sure you let each coat dry for a couple of minutes before applying the next coat. 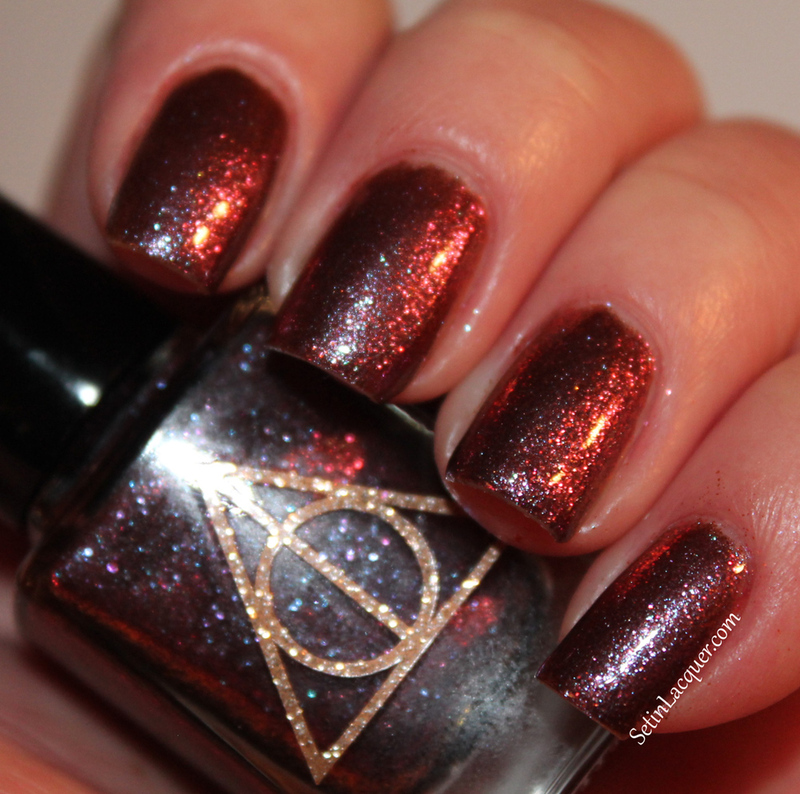 Polyjuice Potion - is a shimmery brown that has a lot of gold accent shimmers. 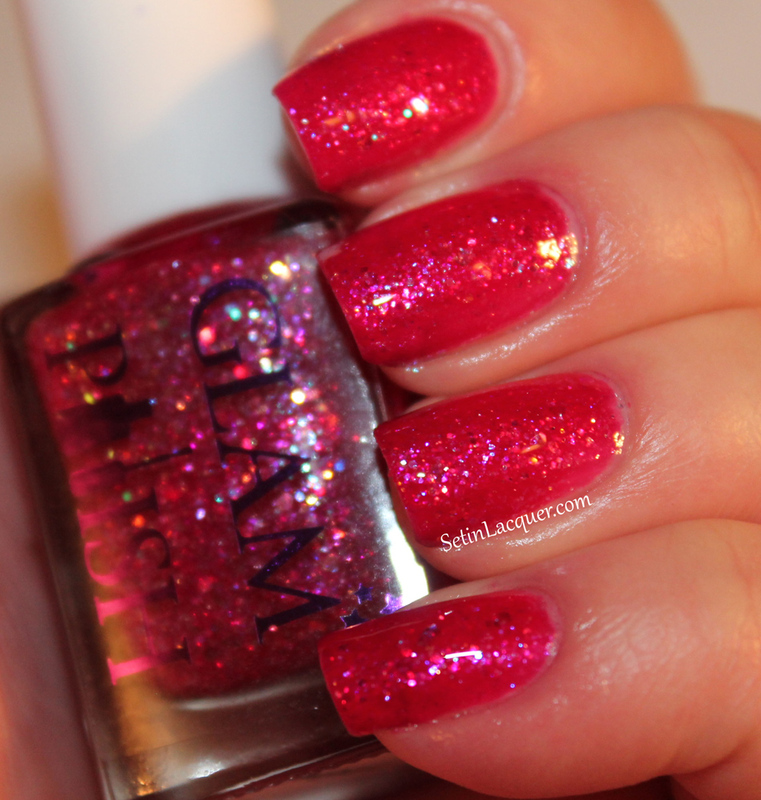 It is a micro glitter polish and is completely spell binding! The micro glitters pick up and magically transform every light source. Thestral - is another gorgeous work of sorcery. It is a shimmery brown with a lot of purple shimmer (which does not show up in the photos.) But trust me... it's there and it's powerful. 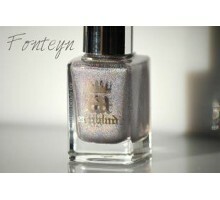 Fandom Cosmetics has a huge selection of polishes and nail decals in their online store. Polishes can be purchased for $8.95 for a full size bottle or $4.50 for a mini bottle. Take a look and I am sure you will find the fandom you are looking for. This Harry Potter collection will be released on February 16, 2014. To keep up with the latest releases and fandom news follow them on their Facebook page. These polishes were sent to me for an honest review. All opinions are my own. Please note computer monitors and mobile devices may all show colors differently. 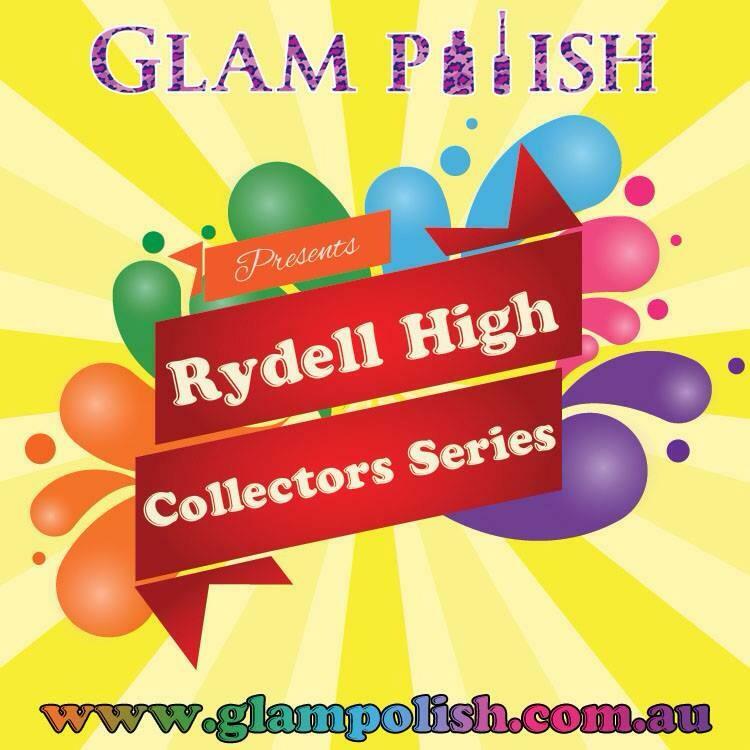 I have some stunning polishes to share with you today - Glam Polish Rydell High Collector's Series - Part 1. 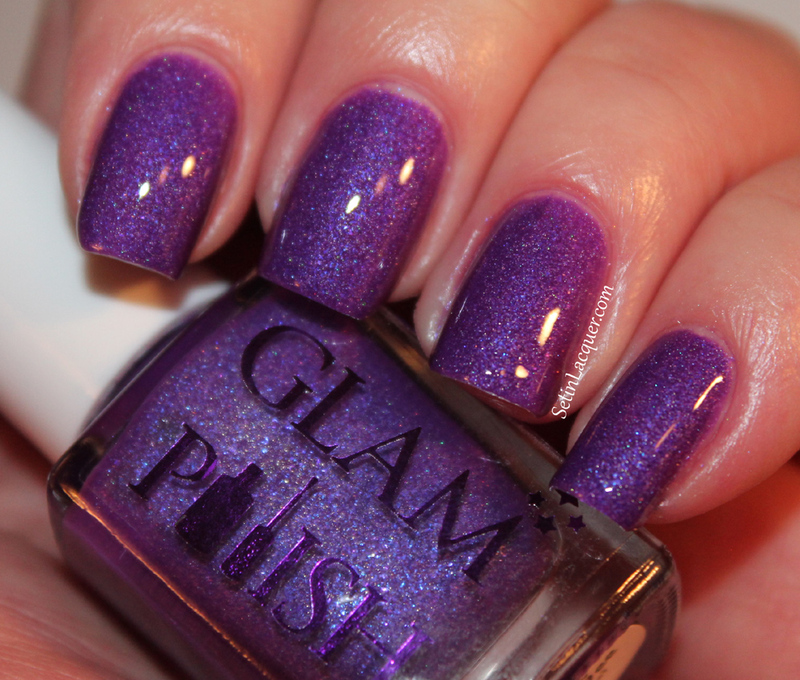 If you have tried Glam Polish - you know how wonderful they are; and if you haven't tried them - you should! The Rydell High Collector's Series will be released over the span of three months and was inspired by the movie/musical "Grease." The shades in the collector's series are a mix of bright and neon scattered holo bases with gorgeous shimmery micro flakies. One word of caution - applying these polishes will have you dancing and singing the soundtrack from "Grease." I think I have all those fun songs stuck in my head. Which is okay I guess, There are worse things I could do. I think I went through the entire soundtrack. My dogs were watching me and I am sure they thought I had completely lost my mind. Part 1, which I will be showing you today are available for pre-order at $10.95 each. 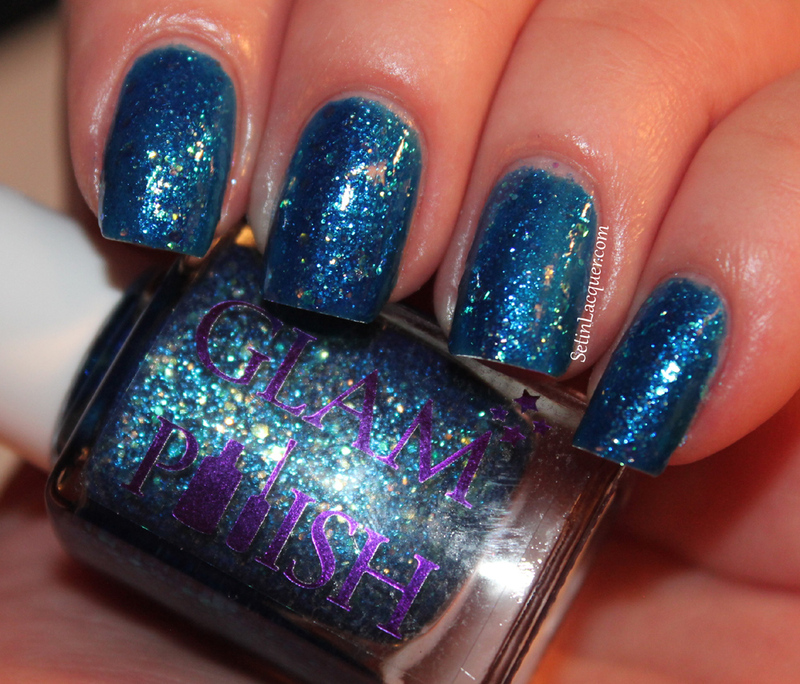 Summer Nights - is a glorious aqua blue with shimmer and scattered holo. I love this shade. Like does he have a car?" 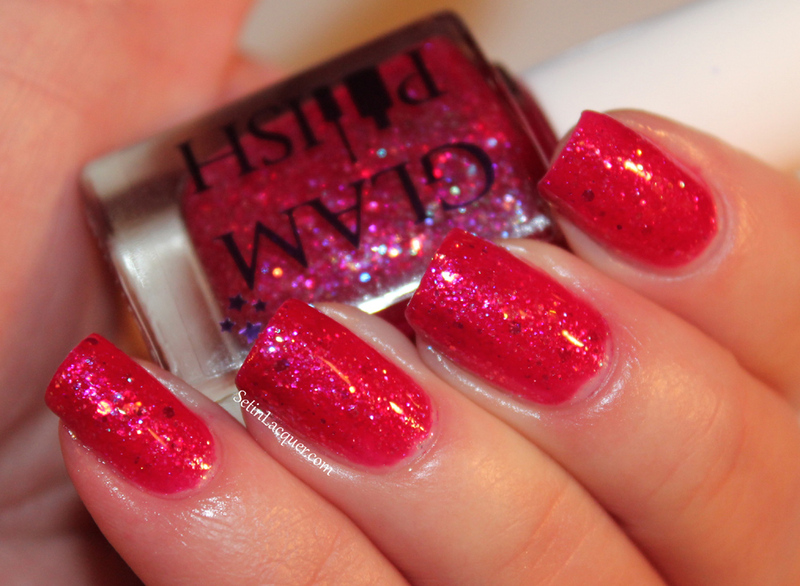 Hopelessly Devoted - is a romantic soft coral/pink. 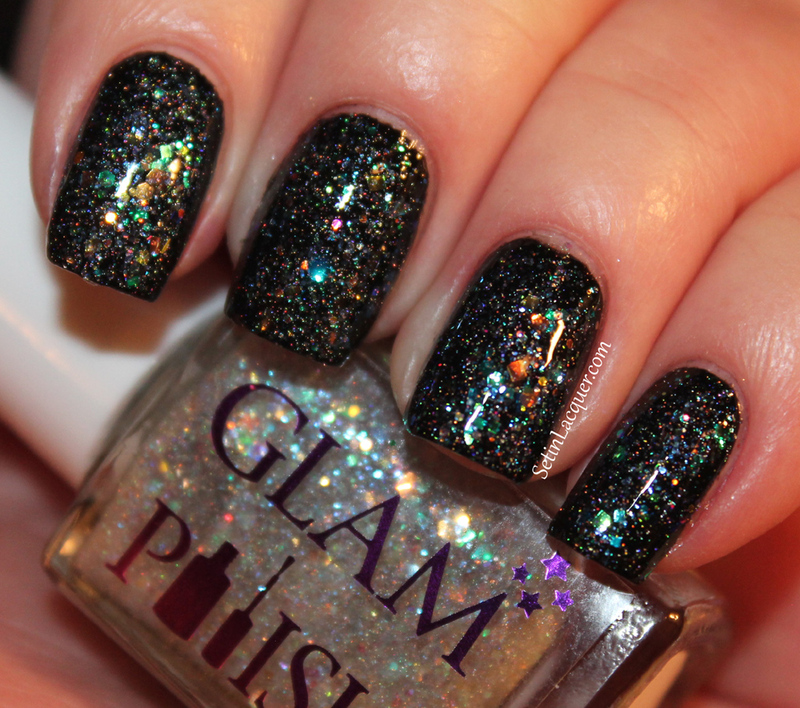 It is loaded with shimmer and holographic particles. 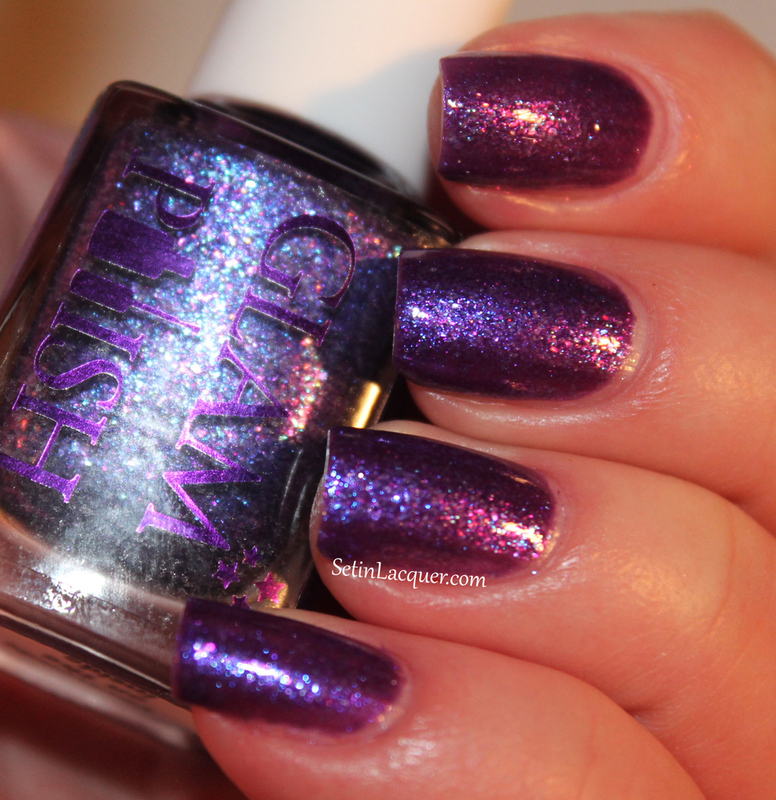 I'm hopelessly devoted to you"
Look at me, I'm Sandra Dee - is a provocative purple filled with holographic goodness. I love this one! 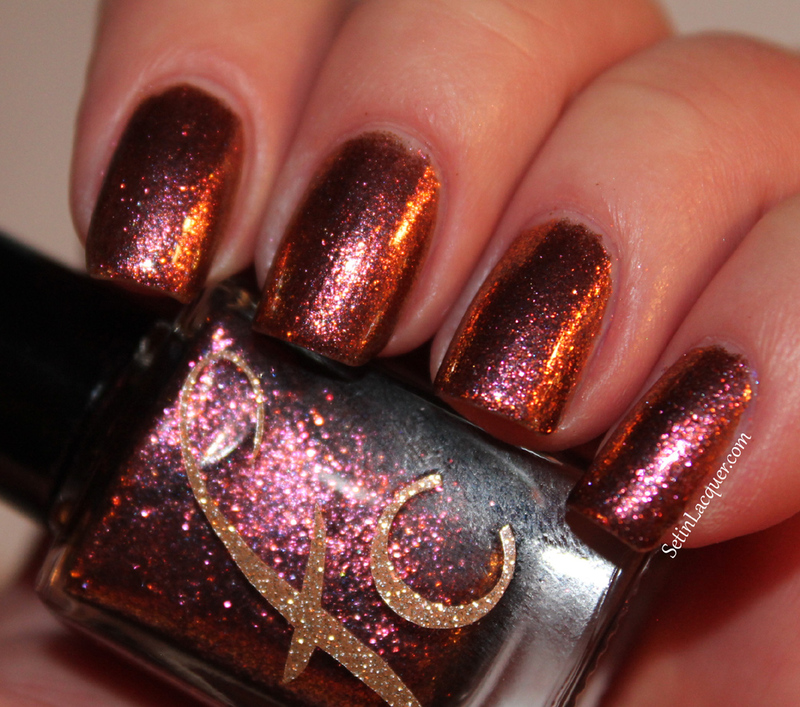 I can't; I'm Sandra Dee"
The January shades are available for pre-order now from the website along with other new release shades for this month, the official release date for the January collector's series shades is Jan. 30, 2014 and all pre-orders will be shipped by this date. Part two of the collector's series will be available for pre-order on Feb. 20, 2014 and part three will be available for pre-order March 20, 2014. All the shades are limited edition (not numbered) and cost $10.95 each. They can be ordered from the website with shipping to Australia and the U.S. available. International fans - a very small quantity will also be available in late February or early March from some of the International Stockists.